Budapest is a dream city for so many reasons. A rich history can be seen in the worn down buildings from neighbourhood to neighbourhood. Beautiful boulevards that remind me of Paris and bustling cafes and bars for the lively travellers. A richly blended cultural city that is divided among two sides of the Danube River, both Buda and Pest providing vastly different yet equally exhilarating scenes. There isn’t a shortage of things to do or see in this unbelievably city. One of my favourite things to do while traveling is to submerge myself in to the food scene. Budapest also has a rich food culture and an exciting one at every turn. Each cafe, bakery, or restaurant is found offering exquisite options that will leave you feeling deeply satisfied and inspired. Many restaurants, of course, have hearty Hungarian dishes such as goulash, chicken paprikas, and fisherman’s soup. There was no shortage of goulash in the city and it seemed that the main feature of any dish was beef, potatoes, peppers, onions, and a hefty splash of paprika. 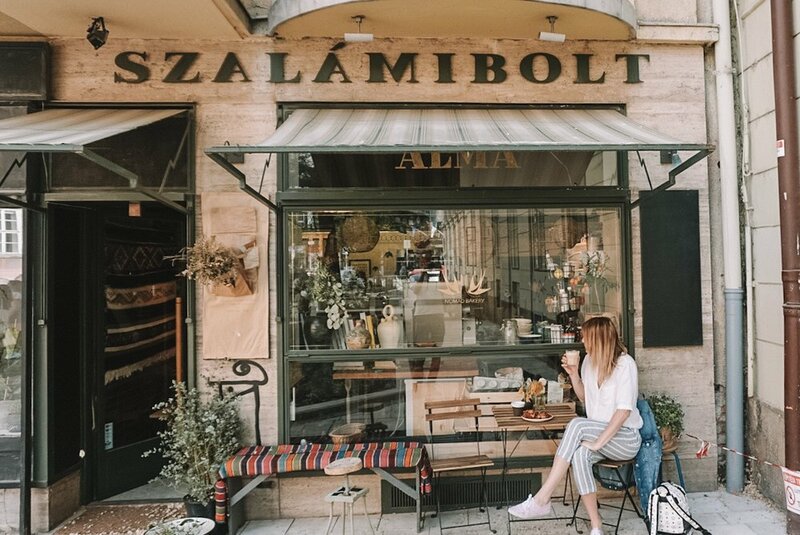 Eating more of a plant-based diet, I admit I didn’t try any of the famous stews however we found so many unbelievable cafes and restaurants, we would need a few weeks to test them all! The tiniest, most wonderful restaurant you could possibly imagine. Tucked away off of any main street, in an incredible fun little artsy ally is where this hidden gem sits. Across the ally is their sister-coffee-shop where you can go and order a coffee from there and bring it back to your table. We ate here twice and had our brains blown. You can see them preparing the dishes right in front of you, each dish made and inspired by the freshest local ingredients. They only have about six tables so you might not be seated right away. But not to worry, grab a coffee or wander the little art-shop right next door. Check out their take on avocado toast below and a delicious ‘mashed potato dish’. Yes please. Basically everything you could hope to find while traveling. The first day we couldn't actually find the storefront because it was so tucked away and when we eventually found it after wandering the block in circles for a solid 15 minutes, it was closed. Not to worry. We ended up coming back the next day to enjoy it and then the following day as well to grab a few treats for our road trip ahead. The interior was an extremely busy, rustic dream with only one small table outside. It’s adjacent to the most adorable little square off the beaten path. So regardless if there’s a seat at the table, grab your coffee and snack and relax the morning away by people watching in the square. This bakery is a husband and wife duo who make the freshest baked goods and most delicious coffee. Locals were coming from pretty far distances to stock up. Just make sure you’re early so you can experience all their creations. If you're ever in Budapest I recommend going out of your way to find this place. You will not be disappointed. When traveling, my husband and I are always trying to find the best, healthiest eats. Often difficult when traveling so we make sure to do a bit of research before. This shop has gluten-free and vegetarian options which is a large bonus. They had some quick options too incase you were needing a healthy on-the-go snack. If anyone has a sweet tooth I would recommend a little afternoon pick-me-up at this gelateria. Awesome flavours, can't beat the presentation, sitting right next to St. Stephen's Basilica. Grab your gelato and wander the picturesque neighbourhood and make your way along the cobblestone streets. An edible rose and a view. Check. Lucky for us all we had to do was roll out of our beds and down the stairs to get to this restaurant. The breakfast spread was awesome but we also ate a delicious dinner here one night as well. As mentioned in my last Budapest Guide post, this restaurant and hotel is right next to the Oprah House so the view was spectacular. I loved the atmosphere of this entire hotel and restaurant. This Cafe is known as one of the most beautiful in the world and I would have to agree. Formally known as the New York Palace, the building was constructed in 1894 by the New York Life Insurance Company as a local head office, now is part of the luxury hotel (The Boscolo Budapest, Autograph Collection). We stopped here at the beginning of our walking tour so I could grab a coffee and check out the magnificent interior. During our little coffee break we also had a full orchestra playing during our time there - I would say worth the five dollar cappuccino! Skip the food and go straight to dessert. Mediterranean food is my weakness. Give me all the fresh Israeli salads, falafels, hummus, and baba ganoush and I'll be the happiest camper. One of my favourite things about traveling to new cities is researching and finding the best food that there is. This restaurant (like the others above) was absolutely amazing. My teammate was playing professional volleyball in the city so she ended up meeting for dinner at this restaurant. We got there a little on the late side plus the area where the restaurant was is a little bit... interesting. I admittedly was nervous when our cab pulled up to the street but of course, everything about it was great. Walking into Mazel Tov felt like we were passing through Platform 9 3/4 (for you non Harry Potter nerds there was a paved-brick archway and long tunnel leading to the front entrance). A beautiful semi-open kitchen and super high ceilings, brick stone walls, a ton of plants and wonderful vibes. And the food was to die for. A definite must.